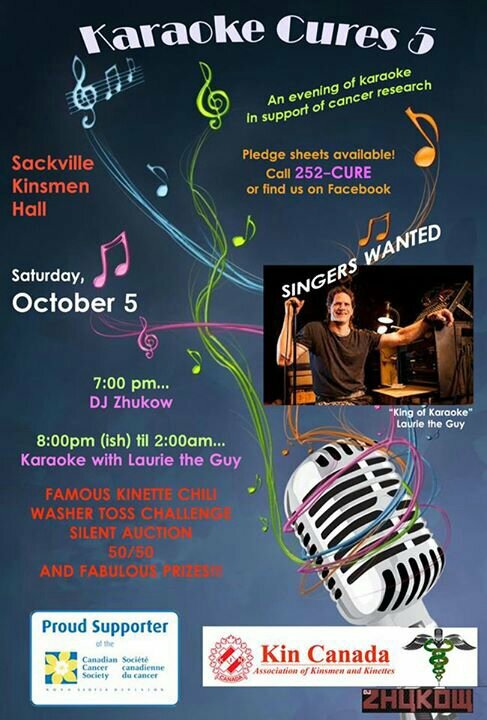 “Karaoke Cures 5” Fundraiser In #Sackville On Oct 5. Come Sing! | Sack-Vegas!!!! “Karaoke Cures 5” Fundraiser In #Sackville On Oct 5. Come Sing! This looks like it could be a good time. Head down to show off your pipes or just go for the party-whatever! There is an auction, so maybe you can snag some goodies as well. Posted by Sacky on October 2, 2013 in Community Events. Laurie is one of the greatest karaoke hosts I’ve seen in my lifetime and is guaranteed to put on a great show for a great cause. I wish you great success!